The first five weeks have officially passed for students at LVC, which means fall break is approaching. The long-awaited initial tests and exams have begun, but fall break will provide students with their first rest period of the academic year. Unlike other break periods, the residential facilities will remain open during fall break as the College recognizes some students may choose to stay on campus. Recreational facilities, academic buildings, dining services and the library will also remain open. The hours may vary for each facility during the break. Though LVC will not officially be in session, all college policies remain in effect for students on campus during the break. 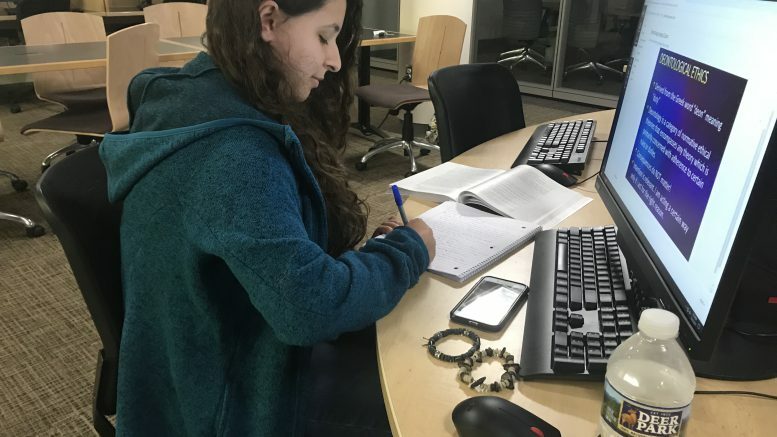 Fall break begins Oct. 5 at 5 p.m. and classes will resume Oct. 10 at 8 a.m.
Pictured is Christina Candelieri, a junior business administration major, studying in Lebegern Learning Commons before fall break.